Anyone who has been down to Central Road Today can't help but have noticed a number of police cordons, the main one being outside KFC. 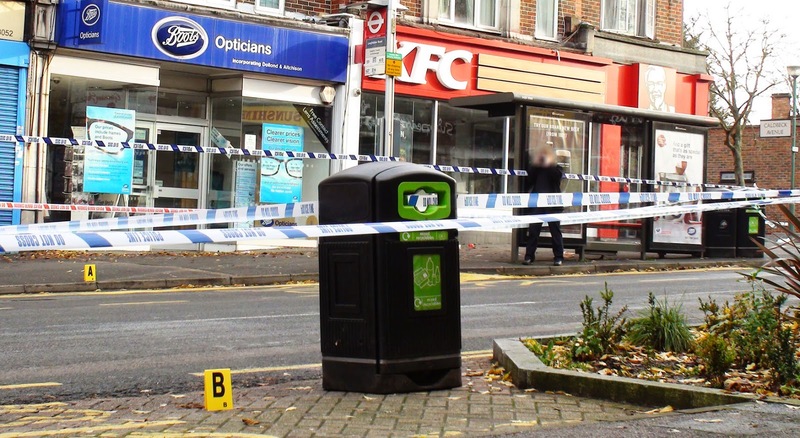 The blog understands that two people were stabbed after a street fight outside the KFC at around 5:45am this morning. 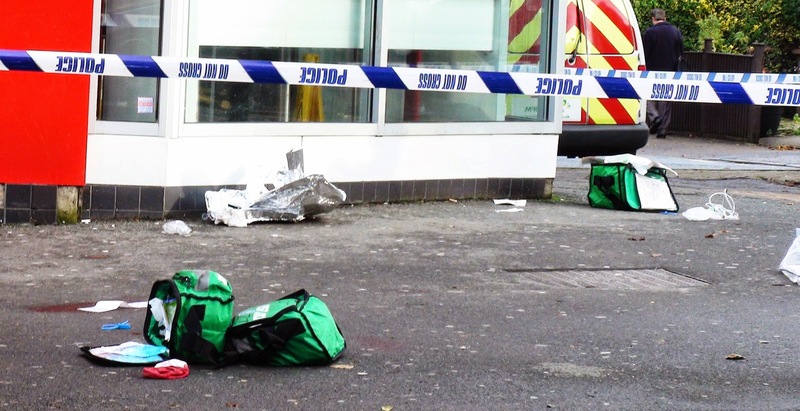 The police have remained tight lipped but it is believed the fight continued down to the bus stop on Malden Road opposite the station where it is claimed a knife was seen lying on the ground. and 19 year old are reported to be in a South London hospital with stab wounds to the legs. Their condition is being described as stable. People in nearby residences and shops heard shouting and screaming at around 5:45am and five minutes later it seems an entire police force had arrived. 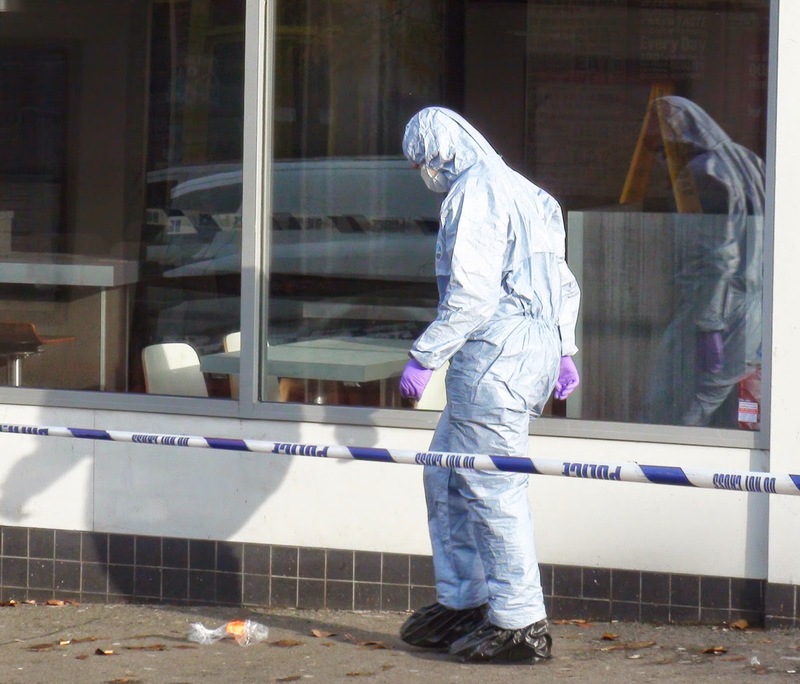 The main crime scene outside KFC still contains medical equipment used to treat victims and was the first area to be forensically examined this morning at around 10:45. People have mentioned seeing a pool of blood on the ground. A second smaller cordon has been set up on the opposite side of Central Road outside Domino's and there is a third larger cordon down at the bus stop opposite the station. Police are guarding all three cordons and people are being asked to cross Central Road rather that walk passed or around the cordon outside KFC. Apparently no arrests have yet been made. Hopefully there will be a police update soon to fill in the missing details. 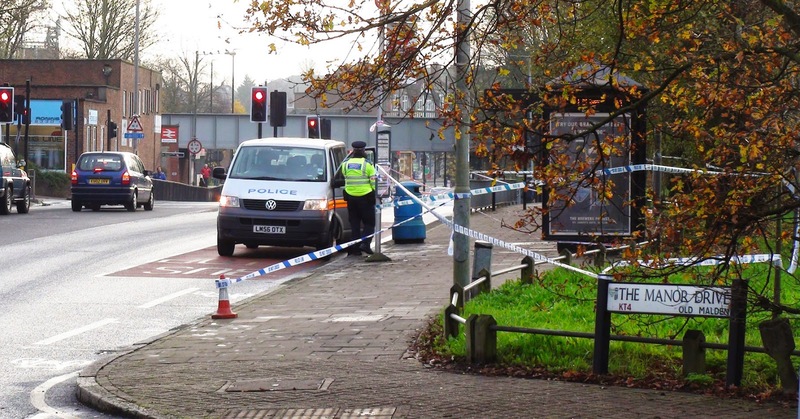 It has been reported that two men have now been arrested for the stabbing. They are apparently neither of the victims. The cordons have come down now. 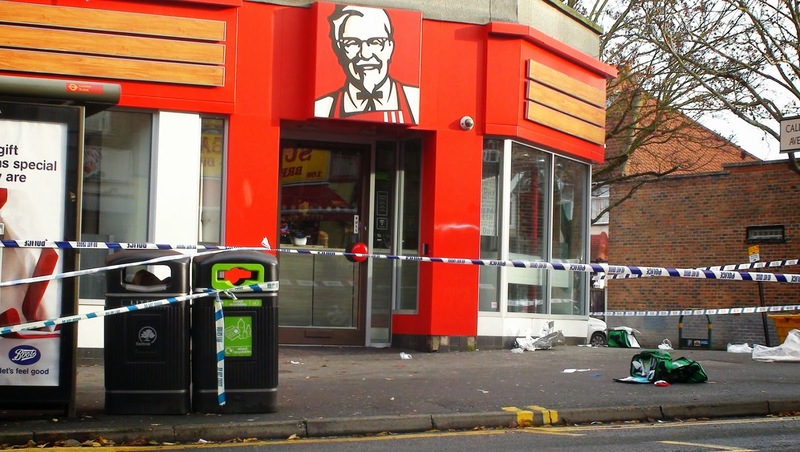 "To alleviate any concerns regarding the incident outside Kentucky Fried Chicken, Central Road this morning, 29/11/14, those persons involved were not local to the area." So while it is not good news that anyone was hurt it is a relief that no one local was hurt. Not so good news that such thugs choose Worcester Park as their preferred venue for stabbing people. According to one blog reader (in contrary to the police message), the victims are indeed local lads and this was an unprovoked attack on them. He said, "It was my best mate so I think I know what happened and where they live." The blog hopes that whoever the victims are, especially of an unprovoked attack, that they make a full recovery soon and that proper justice is served on the perpetrators. If they are local then the blog hopes family and friends who may be reading this will see these lads back on top form a soon as possible. Some better news now. Both stabbing victims have recovered enough to be sent home from hospital. 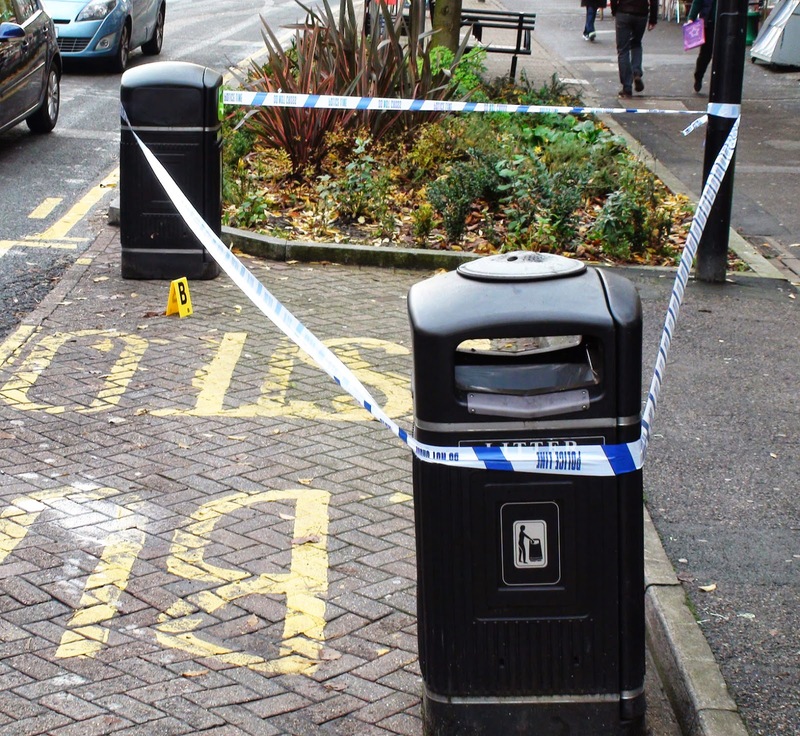 Of the two men arrested over the stabbing, one was released without charge, the other has been released on bail, and is due to return in January. More more details please see the Sutton Guardian item here.